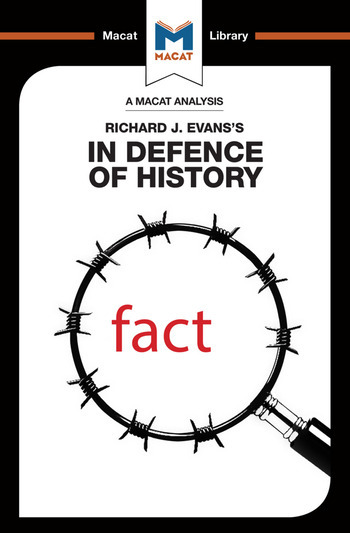 Richard Evans wrote In Defence of History at a time when the historian's profession was coming under heavy attack as a result of the ‘cultural turn’ taken by the discipline during the late 1980s and the 1990s. Historians were being forced to face up to postmodern thinking, which argued that, because all texts were the product of biased writers who had incomplete information, none could be privileged above others. In this reading, there could be no objective history, merely the study of the texts themselves. While In Defence of History addresses all aspects of historical method, its key focus is on an extensive evaluation of this postmodern thinking. Evans judges the acceptability of the reasoning advanced by the postmodernists – and finds it badly wanting. He is strongly critical both of the relevance and of the adequacy of their arguments, seeking to show that, ultimately, they are guilty of failing to accept the logic of their own position. All texts are equally valid, or invalid, they suggest – while insisting that the products of their own school are in fact more ‘true’ than those of their opponents. Evans concludes by pointing out that this same argument could be advanced to suggest that the works of Holocaust deniers are just as valid as are those of historians who accept that the Nazis set out to commit genocide. So why, he demands, is no postmodernist willing to say as much? A devastating example of the usefulness of relentless evaluation. Dr Nicholas Piercey holds a PhD in Cultural Studies from University College, London. He is currently an Honorary Research Associate in UCL’s Department of Dutch in the UCL School of European Languages, Culture & Society.